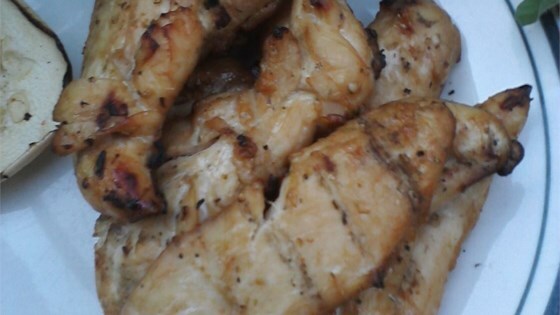 "Flavorful way to grill chicken. Don't be afraid of the peppers and hot sauce - the taste after grilling is still relatively mild. Please use free range chicken if your market carries it fresh. Goes perfect with brown rice and grilled zucchini." In a bowl, mix the rum, soy sauce, lime juice, brown sugar, garlic, ginger, thyme, salt, pepper, hot pepper sauce, and serrano pepper. Pierce the chicken on all sides with a fork. Place chicken in a shallow container, and cover with the marinade. Seal container, and marinate chicken in the refrigerator 8 hours or overnight. Lightly oil grill grate. Discard marinade and place chicken on the grill. Cook 8 minutes on each side, or until juices run clear. Quartered the recipe (1lb bs breasts) and used 1 jalapeno instead of 1/4 serrano. Juicy, but not as flavorful as we were expecting with all the interesting ingredients. over powering flavor from the rum. I used non range free chicken and it worked out.